Earlier this month, adverse snowy weather in Glasgow forced us to cancel our continuing professional development event “My” Student Services: making services accessible for all students. The good news is that we’ve now re-scheduled the event: it will take place on Friday 4 May 2018 in Glasgow. This one day event explores how Student Services can more effectively engage students from different racial, cultural and minority groups, so that these students feel comfortable and included when accessing services. Most of the programme will be the same as we originally planned, but some sessions will be different because the speakers aren’t available on the new date. The event will take place in central Glasgow, and we’ll publish details of the venue shortly. Find out more and book your place here: “My” Student Services. AMOSSHE is hosting a continuing professional development day for senior Student Services managers to help you develop key skills to enhance your influence and impact. Join us to take a fresh look at how to improve areas of expertise that are essential to your role, and consider new perspectives to develop the skills you rely on. Influence - how to engage institutional stakeholders and leadership teams, identify the levers that influence them, and communicate effectively to align your mission to stakeholders’ goals and concerns. Demonstrating impact - how to use data and evidence to articulate the value and impact of Student Services interventions, in order to gain recognition, raise the profile of your work, and compete for resources. Developing frameworks and processes - how to ensure that your Student Services policies and associated procedures are consistent and effective, involve the right stakeholders, address the right audiences, adhere to relevant requirements, and remain current. This event is designed for experienced Student Services leaders, including directors of Student Services overall, and heads of service. Take the opportunity to review and refresh your skills, and build your expertise for taking on new remits. Influence and impact: essential skills for Student Services leaders takes place on 20 April 2018 in Birmingham. Find out more and book your place here: Influence and impact. Unfortunately AMOSSHE has taken the decision to cancel our continuing professional development event “My” Student Services, which was due to take place this Friday, 2 March 2018, in Glasgow. There are currently red weather warnings for the Glasgow area, and the Met Office is not expecting the weather to improve substantially before the weekend. A red weather warning means that extreme weather is expected, and the Met Office advises taking action now to keep yourself and others safe from the impact of the weather. In light of this, our team has cancelled the event with due concern for disruption to delegates’ and speakers' journeys both to and from Glasgow. Our current plan is to try to reschedule the event for another date (to be decided). If you were booked to attend on 2 March, and are able to attend on the new date, we’ll make sure that you have a place. However, if you can’t attend the rescheduled event, AMOSSHE will reimburse your delegate fee. Our sincere apologies for having to cancel at late notice for reasons outside of our control. If you have any questions, please contact the AMOSSHE National Office team at info@amosshe.org.uk. Today AMOSSHE, The Student Services Organisation launches the resilience toolkit: an open, online resource bank of research, case studies and practical tools to help Student Services professionals in higher education develop student resilience to stress, anxiety and similar barriers to achievement and success. The toolkit advocates a positive and proactive approach to student resilience, focusing on what higher education providers can do to develop supportive, enabling cultures for students by making improvements to their physical and social environment. The project was made possible by funding from Unite Students, the UK’s largest manager and developer of purpose-built student accommodation, who are driven to provide a ‘Home For Success’ for almost 50,000 students across the UK. It builds on the theoretical model published in their Student Resilience: Exploring the positive case for resilience report (May 2017), which explores the positive case for resilience. The resilience toolkit is a practical and educational resource, drawing on publicly available materials from around the world, to help Student Services professionals develop new strategies and approaches underpinned by research, and to learn from others’ experiences. Emotional control - use these resources to help students control their emotional responses to the negative experiences they may encounter academically or socially while studying. Self-management - use these resources to help students develop self-management techniques for dealing with stress, anxiety and the pressures of higher education. Social integration / networks / relationships - use these resources to help students feel integrated, develop their social networks and relationships, and get involved with different networks, communities and extra-curricular activities. You can find the resources you want by exploring one of these approaches, or by searching for key words to identify the type of resource (for example, case study, research report, intervention tool, learning material), or subject (for example, mental health, careers, accommodation). AMOSSHE and Unite Students acknowledge that the concept of resilience is a hotly contested one, at least in the way it applies to students studying in higher education, and must be treated with caution. Our stance is that the term must not, in any way, be used to label students or place abject judgements or limitations on their abilities. Rather, our exploration of resilience relates more closely to the environment we provide for our students, both social and physical, and how that supports students to achieve their potential. So the toolkit advocates a positive, proactive approach to resilience, rather than a deficit model. Higher education providers can do a great deal to develop a supportive and enabling culture for their students, by making improvements to their physical and social environment. The toolkit is designed to assist and enable that aim. The project dovetails with Universities UK’s #stepchange strategy to adopt mental health as a strategic priority in higher education, and reflects a whole-university approach, in that the toolkit features resources to support staff and student resilience alike. The resilience toolkit is designed to be a living resource bank that grows as more resources become available. As the number of resources increases, areas of professional expertise will develop too (for example, resilience in careers, building resilience in accommodation). AMOSSHE will continue to add resources to the toolkit from across the UK and international student support sectors - you can subscribe to get an update every time we add something new. Do you have a practical tool, research, or a case study to contribute? If so, please get in touch on by clicking ‘contribute’ at the top of the toolkit. And please leave your comments, and share what you find with colleagues across the sector. Find out more about the toolkit, check out the resources, and contribute to the project, here: resiliencetoolkit.org.uk. How can we make services accessible to all students? How can Student Services more effectively engage students from different racial, cultural and minority groups, so that these students feel comfortable and included when accessing services? AMOSSHE is hosting a continuing professional development day to tackle this question: "My" Student Services: making services accessible for all students takes place on 2 March 2018 at the Grand Central Hotel in Glasgow. Marianne Lemond (Student Experience and Equalities Manager) and Jo Tomlinson (Counselling and Wellbeing Manager, University of Brighton) exploring unconscious bias training for professional and academic staff, and students. Jess Moody (Senior Policy Adviser, Equality Challenge Unit) discussing how to ensure that students of different faiths and cultures feel comfortable accessing your services, and feel that services are safe spaces for them. Rotimi Akinsete (Director of Wellbeing, University of Surrey) exploring how to identify student groups who are not accessing services, the conscious or unconscious barriers that deter them, and designing more inclusive and engaging services. Find out more and book your place here: "My" Student Services. In 2016/17 AMOSSHE supported a project undertaken by the University of the Highlands and Islands (UHI) to develop digital tools for staff to help support students' mental health. This was part of the AMOSSHE Insight project funding programme. The UHI project is now complete, and its main outcome is an online toolkit for all higher education staff to help them identify and support students who may be experiencing mental health challenges. The toolkit includes resources aimed at staff who teach and/or work with distance learning students, whose interactions chiefly occur online. The UHI project team has also written a report about how they developed the toolkit, its research background, and recommendations for the sector. Each year AMOSSHE commissions a range of small projects from member organisations as part of AMOSSHE Insight. AMOSSHE is committed to a research agenda led by our members' priorities, to support professional development and broaden the evidence base for Student Services in the UK. AMOSSHE supports members' project work in order to share innovative research, expertise and best practice across the Student Services sector, and enable continuing development and improvement. This is the purpose and goal of AMOSSHE Insight: to develop and share insights for the benefit of all members. Find out more about the UHI project and access the resources here: AMOSSHE Insight: digital tools to support students’ mental health. Join AMOSSHE, The Student Services Organisation next month to explore how to develop engaging, supportive residential environments for students that encourage a sense of belonging and contribute to student success. Building belonging: the role and impact of residences on student success takes place on 9 February 2018 in Bristol. Induction and transition – with sessions about establishing a sense of community, supporting student-resident transitions from home to the private sector, and initiatives at key transition points. Residence life – with sessions about delivering services across a diverse residential portfolio, pro-active, responsive and coherent support in residences, and residence life programmes. Crisis management – with sessions about collaboration and information sharing to avert crises, tackling gender-based violence in university accommodation, and managing students in mental distress and/or engaging in anti-social behaviour. Find more detail about the programme and book your place here: Building belonging. 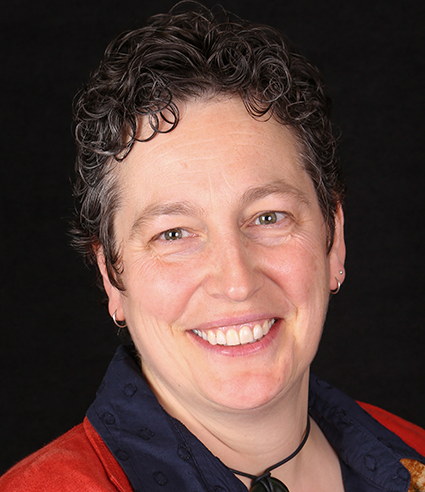 Today Jayne Aldridge (Director - Services for Students, Kingston University) takes the role of Chair on the AMOSSHE Executive Committee, in place of Ben Bailey (Director of Student Services, University of Birmingham). Ben has stepped down from the role in order to lead the establishment of the professional services community for the University of Birmingham's new overseas campus in Dubai. Jayne was previously AMOSSHE’s Vice Chair (Operations), and nominated for the role of Chair in 2016. Jayne will now occupy this key position until the end of the 2017/18 academic year. Executive Member Nicole Redman (Director of Student Support, University of East London) replaces Jayne as Vice Chair (Operations) until September 2018. Nicole has many years’ experience of the Vice Chair (Operations) role, having only recently stepped down from the position. To take the Executive Member vacancy left by Nicole, the Executive Committee has invited Rotimi Akinsete (Director of Wellbeing, University of Surrey) to join the AMOSSHE leadership team for the remainder of 2017/18. Rotimi nominated to join the Executive in June, and AMOSSHE is delighted to be able to welcome him on board. Many thanks to Ben Bailey for all his hard work as AMOSSHE Chair, and for his commitment and dedication to AMOSSHE for many years. The AMOSSHE Executive and National Office teams wish him all the best for his exciting undertakings in Dubai! Find out more about the AMOSSHE Executive Committee. Building belonging: the role and impact of residences on student success is the theme of the AMOSSHE winter conference 2018. This one day event explores how Student Services and colleagues can develop engaging, supportive residential environments that encourage a sense of belonging and contribute to student success. The conference takes place on 9 February 2018 in Bristol. Booking will open soon, but please save the date in the meantime! Watch this space: Building belonging. We're trying something new at the 2018 winter conference. We want to create a space for you to showcase your good practice, innovative ideas, and success stories. You can take part by presenting a poster that summarises your work and achievements. We want your proposals for posters that give an insight into how you've developed engaging, supportive residential environments that foster student success in higher education. The deadline to submit a poster proposal is 17:00 on Thursday 14 December 2017. Find out more here: Winter conference 2018: call for posters. 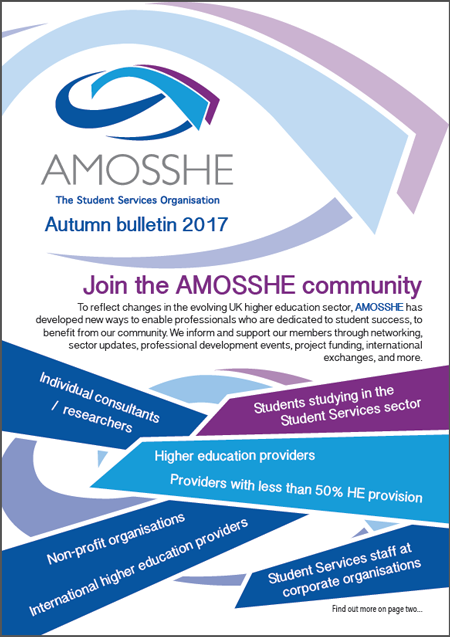 Here's the AMOSSHE quarterly bulletin for autumn 2017: a roundup of AMOSSHE news, events, and more (click image to view - PDF 4 MB). If you’re a professional dedicated to student success in higher education, you can benefit from the network and resources of the AMOSSHE community. In this bulletin, find out about our new membership categories, which AMOSSHE has developed to reflect changes in the evolving UK higher education sector. These categories enable more people to join us and contribute to student success through Student Services. Also in this bulletin, find out about our plans for the 2017/18 academic year, which include the development of a student resilience toolkit, project funding, continuing professional development events, and more. As well as this, meet the AMOSSHE Executive team members who were elected earlier in the summer to lead our professional association for the next two years.